A Strange sites in Irkutsk, Siberia was found in 1949. The site is a large convex cone with a funnel-shaped recess and rounded hill in the middle, which looks a little like an eagle's nest with eggs lie in it. 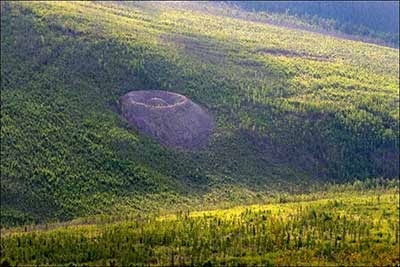 Sites that came to be known by the name of this Patomskiy Crater, its origin has puzzled scientists for decades and emerged allegations submitted by people about the existence of this site, ranging from nuclear explosions, secret gulag mine, lacing meteorites, even associating with UFOs and aliens. Current thinking is that the site was created by a meteorite, but no evidence has been found to support this theory. This cone 80 meters high and has a diameter of 150 meters. The depth of his inner circle is approximately 10 meters. The site is named Patomskiy, according to the name of a nearby river and was discovered by a geologist named Vadim Kolpakov who tried (and failed) to organize a scientific trip to check out this site. But since almost the past year, has many expeditions made to this site and collect samples. The notion that this mound is slagheap (mine or industrial discharges) giant has declared impossible because there are not enough people who live in the surrounding area at the time of this crater is formed. And also there is never forced labor camps or gulags in the region. Half a ton of samples taken from the site by helicopter last year. These samples led scientists to dispel allegations such as uranium ore blast of radiation at the site is very low and there is no uranium found there. So the only two remaining allegations, namely volcanoes and meteorites. However, in this mysterious site not found meteoritic material and the area where the site is not considered to be volcanic. In fact there are no volcanoes in thousands of kilometers from the crater Patomskiy and also seems the site is relatively new. 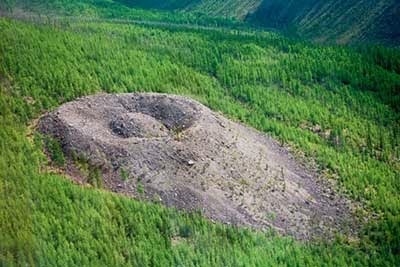 Scientists think that the crater Patomskiy aged between 100 and 500 years, and it could be this crater is evidence of the Tunguska meteorite, which fell in the Krasnoyarsk region in 1908, but the crater was never found. It is estimated that the meteorite was visible 70 miles away from the 'eagle's nest' and this distance is only 10 to 15 seconds flight. Tunguska event occurred in 1908, the age of which is included in the estimated age of the crater Patomskiy, but recent tests have shown that the crater Patomskiy actually 250 years old so it could have been formed by a meteorite that fell earlier when the area was virtually uninhabited. Scientists now think that there is something with high iron content and ferromagnetic materials that are between 100 to 150 meters below the crater. They believe it could be a meteorite or a very solid object to another, but they are not yet convinced. The fact that this Patomskiy crater 'live' in the sense of constant flux - the increase in height and avalanches material and that the nearby trees grow faster than normal, adding to the mystery of this Patomskiy crater.